B Laura back home in Saskatoon after five months at Stollery Children's Hospital in Edmonton. WHAT’S INSIDE The Laura Ward Story . . . . . . . . . . . Message from the Chairman . . . . . Message from the CEO . . . . . . . . . . Message from the SVP, Fund Development . . . . . . . . . . .
y the time Laura Ward was four months old, her tiny body had endured eight major surgeries—six of those being open-heart surgery, 17 other surgical procedures, three cardiac catheterizations, three cardiac arrests, two mechanical hearts, 127 minutes of CPR and a cumulative of three months on mechanical ventilation. Today, Laura is one and a half years old and her parents, Sarah and A.J., describe her as vibrant and full of life. Their journey has not been easy; it has been filled with ups and downs, heartbreak and miracles. Sarah and A.J. will forever be grateful for the remarkable gift that their daughter received from a family that they had never met. A family that, in their darkest moment, had a conversation about organ donation that saved Laura’s life. David Foster with Nazdana, liver transplant recipient, and her sister in Winnipeg, Manitoba during the Gift Of Life flag raising in 2016.
pril is Organ and Tissue Donor Awareness Month. April 22nd to 28th will be a nation-wide week of events and campaigns that shine a light on the need for organ donor registration. The David Foster Foundation invites you to participate in these important discussions to awaken change and one day eliminate the needlessly long wait times for an organ transplant that families face today. I encourage you to take this time to not only strive for further progress on the issue of organ donation, but to celebrate the lives that have been saved because of it. Group shot! Michael Ravenhill and the group during the Boston Pizza Party that was held at Parq Vancouver in 2017. Message from the SVP, Fund Development April: Organ Donor Awareness Month, with a nationwide week recognizing the importance of becoming a registered organ donor. Outcome: Organ donor registration will increase, bringing us one step closer to eliminating the needlessly long wait times that patients currently endure. • GAIN Group 4-day Destination Event: July 30 - Aug 2 An exclusive 5 star, 3-night, 4-day program for 40 couples at the incomparable boutique Villa Eyrie Resort and Vancouver Island Motorsport Circuit. Full details, including videos and pricing will be available on the David Foster Foundation website mid April. Keep an eye out for more information on our special fundraising events as they are released for 2018. Result: Increased organ availability will create more tomorrows for children in need of a transplant. he success of organ donor registration campaigns will give more children the opportunity to receive the organ transplant that will save their life. This is amazing, but there is a cost. In many cases, parents will leave their work and home in order to stay by their child’s side during the transplant process, resulting in an increased number of families requiring financial assistance. The Foundation is proud to support these families on their transplant journey, but we can’t do it without you. In addition to becoming a registered organ donor, you can help support children going through a life-saving organ transplant by making a donation, becoming a partner or sponsor of the David Foster Foundation, or joining us at one of our 2018 cross-country special event fundraisers with David Foster & Friends. This year, in addition to sharing his time and talent at the 2018 David Foster Foundation events, David will be producing new music with some of the world’s most recognized and accomplished musicians, returning as a judge on Asia’s Got Talent, writing music for the brandnew broadway musical—Betty Boop, and touring both North America and Asia on his HITMAN Tour. Between all this, David continues his incredible work as chairman of the David Foster Foundation and donates his time to multiple other charities. The David Foster Foundation’s cross-country fundraising events for 2018: • An Intimate Evening with David Foster & Friends An evening of story-telling, piano, song, laughter, and mingling with 16-time Grammy Award winner, David Foster. Locations and dates to be announced! Of course John is an organ donor! Eight Ways to Give 1. BECOME AN ORGAN DONOR By becoming a registered organ donor, you may one day save a life. Points are used for travel and accommodation for a family with a child going through this life-saving organ transplant process away from home. The RBC Rewards points can be redeemed to make a direct donation to the David Foster Foundation. A special partnership with Waddington's, Canada's premier auction house since 1850, allows you to donate the funds generated from your art and valuables to the David Foster Foundation. All funds received through the Sponsor a Family program are directed to a specific restricted account. As a result, 100% of the money donated goes to direct family support. The David Foster Foundation works with national partners to help raise both funds and awareness of the Foundation's goals. National partners are recognized on the website, all collateral material, and throughout annual fundraising events. The purpose of the endowment fund is to support all Canadian families who have a child going through the life-saving organ transplant process for years to come. A planned gift is a charitable donation which can be arranged as part of your overall financial and estate planning. 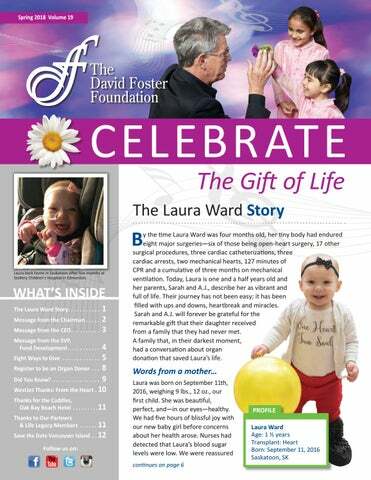 For more details and information on the eight ways you can help families with children in need of a lifesaving organ transplant, visit WAYS TO GIVE on the homepage banner of our website at davidfosterfoundation.com. OUR VISION To continue to provide financial support to the families of Canadian children who are in need of life-saving organ transplants. OUR MISSION The David Foster Foundation is dedicated to providing financial support to Canadian families with children in need of life-saving organ transplants. In addition to helping families with their non-medical expenses, the Foundation strives to increase public awareness and education about the importance of becoming a registered organ donor in Canada and the United States. Laura still smiling after her many surgical procedures. Only moments after they received the news a heart was available for Laura. 8 LIVES LATER! By becoming a registered organ donor, you may save a life one day. Did You Know? The David Foster Foundation • Has assisted over 1,100 families. • Was founded in 1986 and became a national charity in 2006. • Has two office locations: Victoria, BC and Toronto, ON. About Organ Donation • One donor can save up to eight lives. * • A single organ donor can improve the quality of life for up to 75 people. • You are six times more likely to need a transplant than you are to become an organ donor. Organ Donation in Canada • Close to 90% of Canadians are in favour of organ donation, however, only 20% of the population are registered organ donors. * • Even if someone has registered their intent to donate, their family can block donation of their organs after death. • There are approximately 4,500 Canadians waiting for an organ transplant. • About 1,600 people are added to this waitlist each year. • Every year, hundreds of Canadians die while waiting for an organ transplant. • The oldest organ donor in Canada was 90 years old. * • Of the patients on the transplant waitlist, 76% are waiting for a kidney transplant and they will wait for an average of four years. How Organ Donation in Canada Measures Up Globally • The national strategy proposed in 2011 by various organ donation organizations and Canadian Blood Services set a goal of 22 donors per million of the population (dpm). • In 2016 Canada reached 20.9 dpm. • This is an improvement, but far below other countries: Spain - 43.4 dpm United States - 26 dpm *Statistics from The Organ Project, Canadian Blood Services, and Liveon.ca. Lily, liver transplant recipient, celebrated 3 years post-transplant. he David Foster Foundation works hard to keep families together during the life-saving organ transplant process and we are incredibly grateful that our partners and friends at WestJet made that happen for Alyssa and her family through the gift of flight. 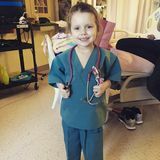 Alyssa tragically experienced heart failure at 9 years old and was placed on the transplant list. Waiting for nearly two years, Alyssa received her life-saving heart transplant when she was 11 years old. Throughout Alyssa’s transplant journey, WestJet provided the family with flights from their hometown in New Brunswick to Toronto. WestJet’s gift allowed Alyssa’s family to stay together when they needed each other the most. In addition to flights, the David Foster Foundation ensured the family’s day-to-day essentials were covered. Alyssa and Blake McGrath during a surprise visit to The Bonnie Kilburn Dance Centre. During the month of February, the David Foster Foundation and WestJet partnered up to help Alyssa say thank you to a community that provided her with kindness, strength, and the support she received during her heart transplant journey. Recording artist and choreographer from So You Think You Can Dance, Blake McGrath, joined the studio to dance with Alyssa’s class. It was a magical afternoon filled with joy, love, and dance. A grateful heart is a happy heart. Please register to become an organ donor today. Watch WestJet Thanks: From the Heart. Thank you Clarke Family, WestJet, Blake McGrath and The Bonnie Kilburn Dance Centre. WestJetters and Blake McGrath with Alyssa's dance class. Alyssa in hospital while she waited for her life-saving heart transplant. he David Foster Foundation has been proud to call the Oak Bay Beach Hotel a community partner for over seven years now. In that time, the Oak Bay Beach Hotel team has demonstrated incredible generosity and a heart-warming commitment to the families that we support. Britton and her sister spending some quality time together with Ollie Bear. A portion of the proceeds from every Ollie Bear sold go towards helping the David Foster Foundationâ&#x20AC;&#x2122;s families on their childâ&#x20AC;&#x2122;s transplant journey. Thank you to the team at the Oak Bay Beach Hotel for sharing a passion in our cause. We look forward to what we will accomplish together in 2018. Callum, liver transplant recipient, cuddles his Ollie Bear. The David Foster Foundation is excited to offer a 4-day luxury opportunity to enjoy beautiful British Columbia with 16-time Grammy Award winner, David Foster. S AV E T H E DAT E! VILLA EYRIE RESORT | VANCOUVER ISLAND MOTORSPORT CIRCUIT | CULINARY CLASSES GOLFING | FISHING | SHOPPING | SPA | HORSEBACK RIDING | CELEBRITY ENTERTAINMENT For more information and to book your spot, please go to davidfosterfoundation.com. Be one of only 40 couples for this once-in-a-lifetime exclusive and intimate experience!